A new addition to the growing number of “free trade” agreements (FTAs) took center stage last Monday as the United States and 11 Pacific Rim countries announced the conclusion of a mammoth “trade” deal that covers more than 60% of the global economy. 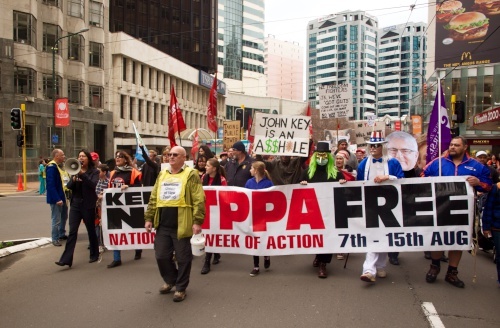 The Trans-Pacific Partnership (TPP) Agreement has drawn strong opposition from countries involved in the negotiations as well as from people’s organisations around the world. It is deemed as a US-conceived treaty that is part of its pivot to Asia in an attempt to maintain its economic clout and counter the rise of China. Like all other FTAs, the TPP is negotiated behind closed doors—only corporate advisors and lobbyists are given exclusive access to the text. In 2010, TPP member states agreed not to release the negotiating text until four years after an actual agreement has been made and/or abandoned. [i] This elicits the obvious question—why keep it a secret? What is in the text that compels negotiating governments to hide it away from public scrutiny? Here’s a hint: the only way to complete the deal is to keep it hidden from the very people who would have to live with its consequences. The ISDS is a dispute settlement modality that allows corporations and foreign investors to sue governments over actions perceived as detrimental to expected future profits. [iii] In other words, the TPP would grant corporations the right to file legal complaints against governments for policies inimical to profit-making such as raising the minimum wage or increasing the quality of basic social services as both actions would cost corporations more capital outlay and therefore less profit. Under TPP rules, signatory countries would be obliged to conform their domestic policies, laws and regulations in accordance with the agreement. Any constitutional protection afforded by national laws would be wiped out to give way to greater corporate control. Based on the leaked drafts, it would also appear that one of the TPP’s key objectives is to diminish the state’s role in national development. Under the guise of “regulatory cooperation,” enormous pressure is coming from big US businesses that want to “level the playing field” between the private sector and state-owned enterprises (SOEs) citing the unfair advantage given to the latter. The APEC Ministerial meetings scheduled in Manila from 18-19 November comes as an opportune moment for the US and its cohorts to celebrate their recent victory with the signing of the largest ‘free trade’ agreement ever concluded worldwide in more than a decade. With the TPP now in place and more importantly, open to new members, APEC Manila is expected to serve as a victory lap that aims to encourage other APEC member countries to join this new trade pact. In effect, it becomes a prelude to cement a larger (or even an APEC-wide) trade deal that serves the interests of the US and its corporations. At the eve of the APEC ministerial, people’s organisations, women, youth, indigenous peoples, migrants, workers, farmers and international activists will gather in Manila for the International Festival for People’s Rights and Struggles (IFPRS 2015) as part of a series of anti-APEC/TPP activities and protest actions to register the people’s demands for a socially just world. As the experiences of the world’s poor and working class have shown, the TPP and other free trade agreements in the offing could only mean one thing: a new world trade disorder where corporate privileges continue to expand at the expense of people’s rights and welfare. [ii] Krajewski, M. (2014). Modalities for investment protection and Investor- State-Dispute-Settlement (ISDS) in TTIP from a trade union perspective. Brussels: Friedrich-Ebert-Stiftung. [iii] Corporate Europe Observatory (2012). Profiting from injustice: how law firms, arbitrators and financiers are fuelling an investment arbitration boom. Brussels: Corporate Europe Observatory. Mark Moreno Pascual (@makoypascual) currently works as Communications Officer for IBON International – a southern International NGO working for peoples rights and democracy. Before that, he spent some years doing research and advocacy with the progressive youth movement in the Philippines campaigning against tuition fee increases and for students rights and welfare.